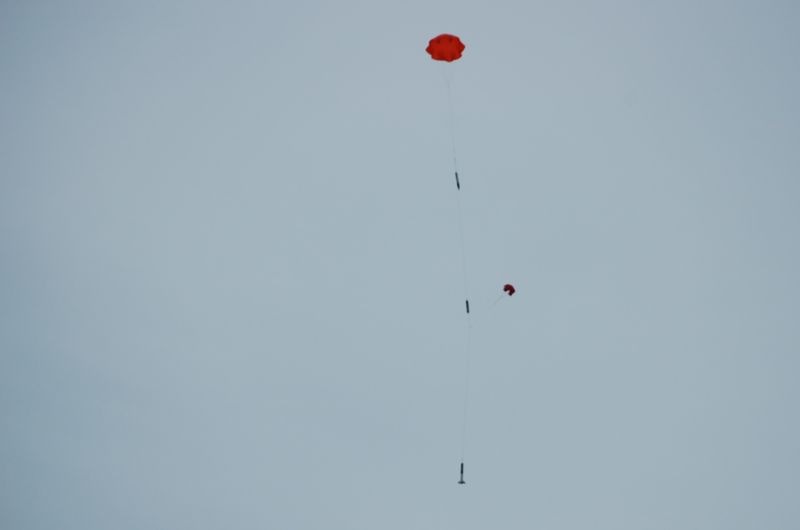 Nesaru returned to the sky with what was planned to be the final of her long range telemetry system test flights. On-location interference in the 2.4 GHz band prevented that test from going forward, but not the launches! She flew two missions using a new thin mil 58″ parachute. This is the properly sized parachute for the Perseus V design, but parachutes thin enough to pack into Nesaru’s air-frame were not available until recently. I found it fun to see Nesaru descend gracefully to the ground on the new parachute. Nesaru flew two missions on September 30th 201. The first, PLS-5014, lifted off in the late morning hours, and reached an altitude of 1310 feet, with a top speed of 198 MPH. Her launch trajectory (straight up) caused her to catch some strong winds above about 800 feet, which pushed her recovery area about a little more than a quarter mile into a dense soy-bean field. 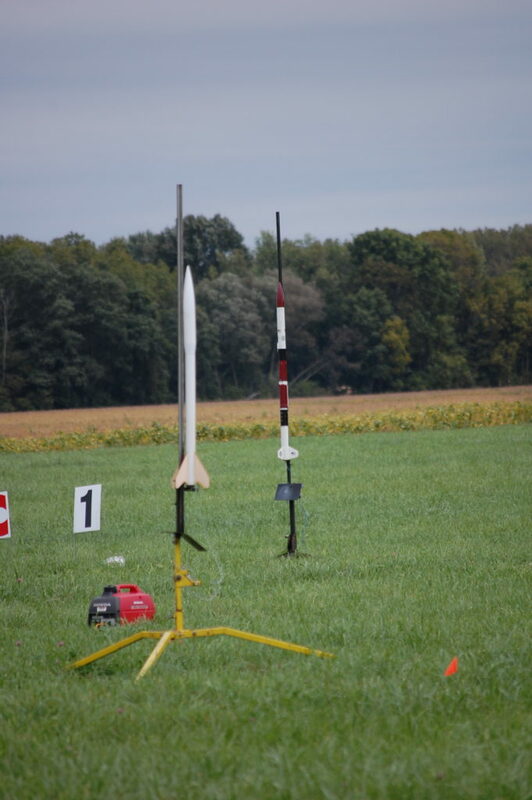 This made recovery quite difficult…not only due to the difficulty crossing soybeans that were no longer standing straight up, but also because it was impossible to see the rocket or it’s large parachute until you were on top of it all! 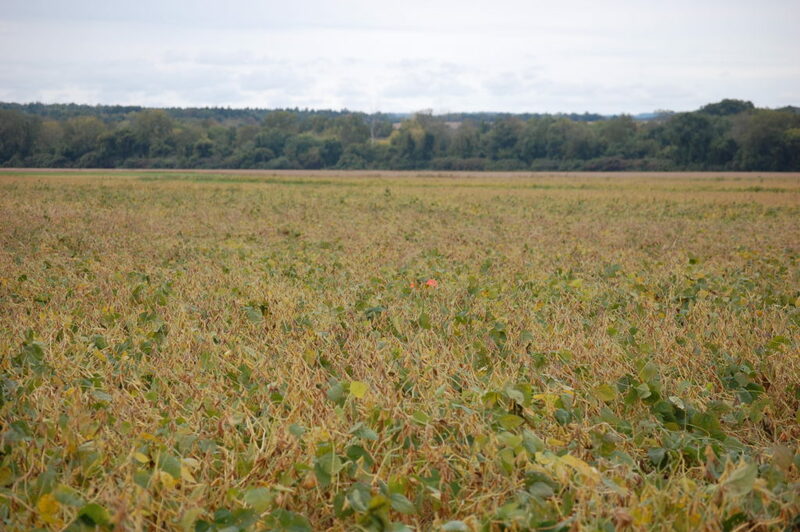 Nesaru’s 58″ parachute is barely visible in the thick soybean field! 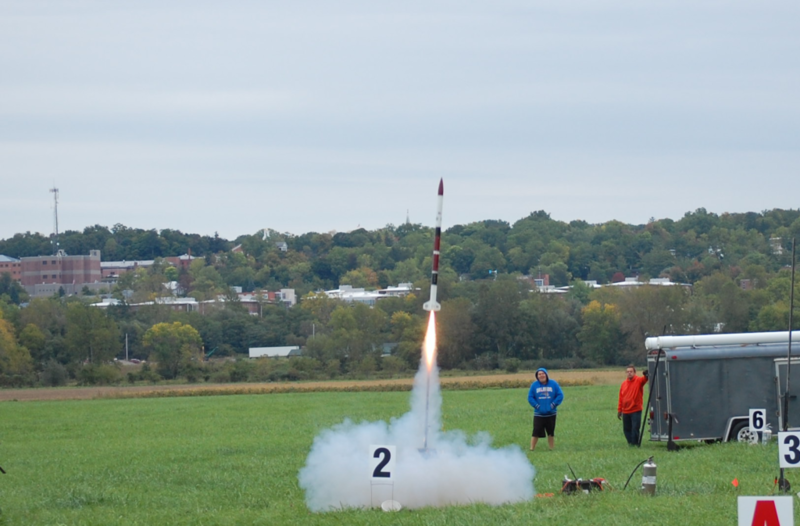 PLS-5015 was launched with a trajectory that placed the apogee event well away from the soybean field, which prevented a repeat journey into the soybean field. This also meant losing quite a bit of altitude. Maximum altitude was 1197 feet, reaching a speed of 202.5 MPH. Both missions were launched on the CTI H-135-14 motor. Electronic deployment at apogee event, motor charge as a backup. Mission 5015 liftoff! Don’t worry…the observers are not REALLY that close. Trick of the lens. They are no closer than I am when taking this picture! Nesaru drifting home majestically under parachute. 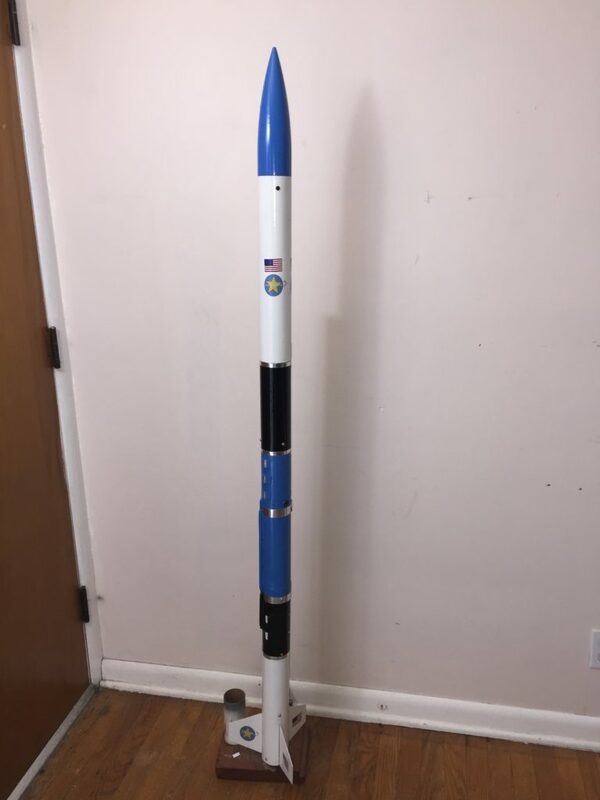 All technology tests will now transfer to the sister rocket, XR6-02 / Ares. 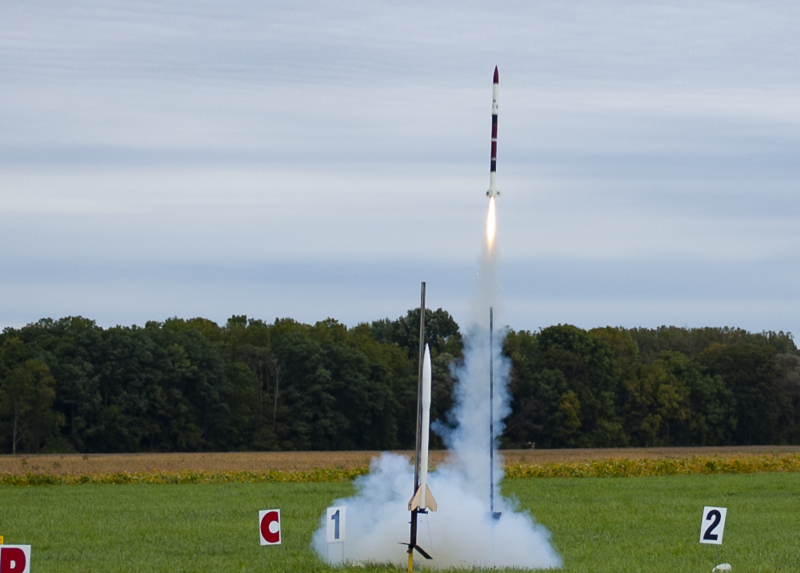 She will resume high altitude telemetry tests, as well as testing other electronic flight instrumentation and construction techniques for a future Level II rocketry certification.